What are they? Malicious small programs that easily replicate themselves, infect your computer, and often spread to others? computers via email attachments or network traffic. What risks are involved? Virus programs can delete files, format disks, attack other computers or just make your system run slowly. They can also create a ?back door? that allows a hacker to run programs on your computer or to access into your files. Install anti-virus software on your computer and run daily updates. 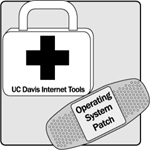 Anti-virus software is available on the UC Davis Internet Tools CD, which can be purchased at the Bookstore Computer Shop for less than $5. You can also download the software from the MyUCDavis Web portal by clicking on the ?UCD Resources? tab. Pick up ?patches? at your operating system's Web site to keep your computer fortified against possible attack. Reduce potential harm of a virus or worm infection by frequently backing up all of your files. Since 87% of viruses originate and are transmitted via email, do not open email attachments with suspicious subject lines, file names, or messages. Some viruses can forge themselves to appear as if they are from someone you know, therefore, the ?from? line alone cannot be trusted. Be aware that viruses may come to you in links sent via Instant Messaging, email attachments, infected disks, freeware, shareware, or file-sharing. Virus-filtering software checks every incoming and outgoing @ucdavis.edu email message for viruses. Widely-recognized viruses will automatically be filtered out of your incoming email. New viruses may still sneak through until the filter is trained to recognize them, which usually takes a period of no more than 24 hours.